Well, I had grand plans for our dinners this week, but you know what they say about “the best laid plans” ….. We were blessed to find out that we were getting to babysit for our youngest grandson this weekend! But how do you cook with a 5 month old in the house? Our youngest is 21, so it’s been a while since I had to juggle baby responsibilities with feeding the family. This recipe happened because I only had time (in between feedings, diaper changes, and lots of hugs and kisses) to chop and assemble. I was feeling rather guilty offering this to the mister for dinner after he had worked all day, but after tasting it, all feelings of guilt vanished. It was delicious! Not only was it delicious, but it’s healthy! Win…win! This is another of those recipes that you put in whatever you have available. 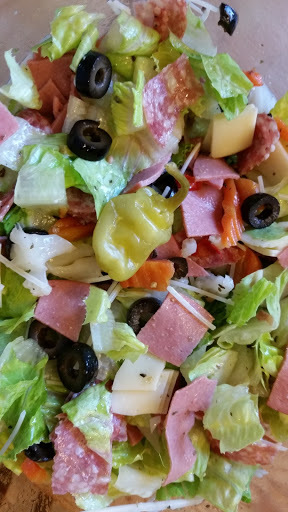 I would suggest using at least equal amounts of veggies/meat/cheese to lettuce. These are the ingredients I used and the amounts are “guess-ti-mates” at best. Prepare all ingredients, place into a large bowl, and toss with the vinaigrette. DONE! You can’t see it, but there is lettuce under all the additions. I think the star of this show is the giardineira. 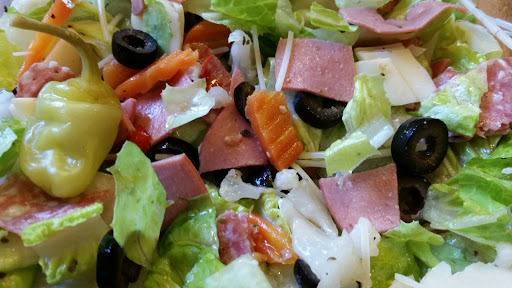 It gives such wonderful flavor to this salad. This is one ingredient I would not omit.